My desire to support the local library, even if it is destroying itself from the inside out, means I’m coming in late with my review of the movie, Maleficent. I’ve already mentioned this in a previous post, so enough said on the subject. I’ve discussed the movie with my friend and co-worker ever since the trailers for Maleficent first appeared. We agreed that Angelina Jolie was the perfect choice to play the character. My friend is into behind the scene facts and gossip about movies. 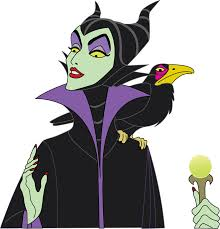 She mentioned that Angelina studied the Disney cartoon extensively to ensure she portrayed Maleficent correctly down to her razor-sharp cheekbones. I must admit I’ve only ever seen clips of the Disney version of Sleeping Beauty, but what I’ve seen clearly depicted Maleficent as the bad character. All of Angelina’s efforts in makeup and costuming certainly went along with what I’d seen. My biggest concern when it came time to watch the movie was that I wouldn’t be able to turn off my internal editor and enjoy watching. I worried that the makeup, costuming, cinematography, and scenery would distract from the storyline. It didn’t, and I was able to take it all in. But let’s actually discuss the movie. If anyone could rage onscreen with the strength of a betrayed woman scorned beyond all reason, it would be Angelina Jolie. 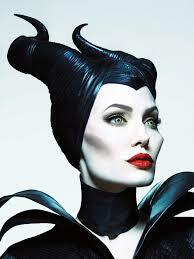 Factor in those horns and cheekbones, and she’s one scary lady. That didn’t happen in Maleficent. The backstory did a good job of explaining why Maleficent ended up bitter and angry, but along the way, someone decided to remove the teeth from what could have been an incredible tale. Maleficent was all bark and absolutely no bite. Instead of watching the main character deteriorate into a sociopathic, homicidal maniac bent on the destruction of a kingdom via the cherished princess, we were treated to a kinder, gentler Maleficent. Seriously? What was the point of making her look fierce if she’s going to offer a clause to her own curse, attempt to revoke said curse, grow close in heart to the victim of her curse, regret her own actions when the curse is fulfilled, and be the only one who could actually break the curse? These changes in script were bland at best and completely undermined the entire story. Perhaps Disney was trying to make a subtle point? Bad people can be redeemed. Perhaps the writers and producers didn’t want to scare children? Take a look at what kids watch on TV. Has Disney forgotten how to portray good versus evil? They certainly blurred the lines this time. I could ask many more questions and read many themes into Maleficent. Quite frankly, it’s just not worth it. For me, the movie didn’t satisfy, and I will be much more skeptical of the upcoming remake, Cinderella. Might have to disagree with you slightly. I enjoyed the movie. Yes there was a little blurring of the lines but I like a happy ending. Even wicked “witches” can be redeemed.